Aldo Nova (born Aldo Caporuscio on November 13, 1956, in Montreal, Quebec) is a Canadian guitarist, keyboardist, vocalist and producer, Nova gained fame with his self-titled debut album Aldo Nova in 1981, and its accompanying single "Fantasy", which climbed to #23 on the Billboard Hot 100. 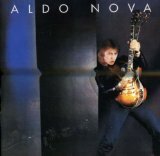 Signing with Portrait Records, Nova released a self-produced album, Aldo Nova, in 1981. It had two singles: "Fantasy" and "Foolin' Yourself". "Fantasy" made him what some would call a one hit wonder. His next album, Subject...Aldo Nova had a minor hit with "Monkey on Your Back," but his solo career flagged and he became a player and songwriter for other bands. He worked with Jon Bon Jovi in both the early and late 1980s and produced some early Céline Dion albums.